Revolutionary discharge system for continuous flexible and rigid foam applications – Hennecke presents the "ZERO AGE APPLICATOR"
Hennecke further developed its partnership with the Kunststoff-Institut Lüdenscheid. Since May of this year the polyurethane specialist has been a member in the sponsoring association and has made a new high pressure metering machine available for a joint project. One of the project's focal point topics is "Painting in the mould". The STREAMLINE was shown by the researchers in live operation at the 2nd industry meeting in Lüdenscheid to well over 1,000 visitors. Future-oriented coating processes have already been the topic of research for 18 years in the project "Surface treatment of plastic moulded parts" by the Plastics Institute for SMEs in NRW (K.I.M.W. or Kunststoff-Institut für die mittelständische Wirtschaft GmbH). 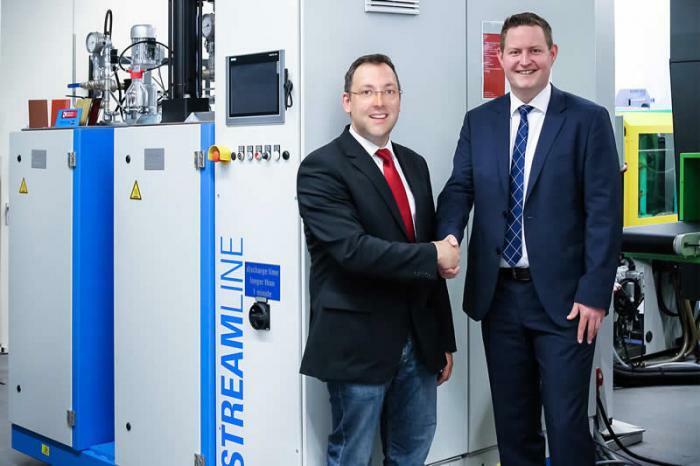 Hennecke is participating in what is now the tenth joint project together with 40 other companies and is making a STREAMLINE for the CLEARMELT® process available – equipped with the HT30evo piston-metering device that can meter abrasive colour pigments. The high-pressure metering machine is fully integrated into an Engel injection moulding machine. The new STREAMLINE also represents a comprehensive update of the metering machine technology previously used at K.I.M.W. With the CLEARRIM technology Hennecke offers its customers a process to realise components with high-grade and functional surfaces. It uses a thin polyurethane layer to finish surfaces. The technology is particularly suited to be combined with other processing techniques. One example is an advanced process development resulting from Hennecke's cooperation with ENGEL Austria GmbH: CLEARMELT® technology. The Austrian machine builder has been Hennecke's development partner for many years. The CLEARMELT® method has been established in the market for years and enables the users to manufacture durable, scratch-proof and yet highly-sensitive, self-curing polyurethane coatings in a time-saving and efficient way. The depth effect of the surface as well as the opportunity to integrate decoration parts and switch functions make this method especially interesting for manufacturers of automobile interior components or consumer electronics, for example. The flooding in the mould with polyurethane systems was worked on extensively in the earlier project "Surface treatment of plastic moulded parts" in Lüdenscheid. K.I.M.W. employees produced numerous test pieces from different thermoplastic/polyurethane combinations. Subsequently extensive trials were carried out on the samples to test the characteristics of these coating systems with regard to adhesion, resistance to scratching , abrasion, cream and media, as well as hydrolysis, durability in changes of climate and UV weathering. Hennecke customers ask increasingly for the CLEARMELT® applications to be equipped with colour pigments and thereby enable a painting process in the injection mould. Due to the increasing demand for flooded plastic parts, one of the focuses in the institute's current surface project is "painting in the mould". According to the institute, the manufacture and finishing of components in one production step is desirable for many reasons. Integrated coating processes offer, among other advantages, less components logistics and a reduced contamination of surfaces, which in downstream finishing methods often generate a higher amount of rejects. The demoulding of such components represents one of the challenges that the institute is investigating in the current project. The polyurethane paint systems used tend to stick to the mould surfaces. To avoid or to reduce the use of release agents, anti-adhesive mould coatings should be researched in the project and their effectiveness for polyurethane systems should be tested in practical trials. The researchers will initially carry out pretests using a testing device, with which they want to determine the general separation effect. Finally two to three potential coatings should be integrated in the experimental mould and be sampled with selected polyurethane systems for validation. The moulding of mould surfaces with polyurethane represents a further focus. Different structural techniques should come into effect, in order to be able to introduce graining, lettering or very fine microstructures into the mould. Among other things, in Lüdenscheid they want to analyse the achievable degree of moulding through visual measuring methods. Other project focuses are "digital printing" and "scratch-protection through coating technology". Hennecke is additionally planning a beginner's training programme for the CLEARMELT® process together with the K.I.M.W. In a two-day course the participants will be able to learn through theory and practice directly on the machines to master the process and how to correct potential mistakes. This training offer has until now been unique on the market.